If you've been keeping up with the US Presidential Primaries, the one thing that seems to be clear is that this year is the Democrats really seem to be upstaging the Republicans as far as media attention goes. It's very possible that the Democratic Party may be able to use this momentum from the primaries to get into the White House. And if they do, that will be very bad for Paper Comics. I would like to submit to you that some of the best comics have come from times when they were written by liberal individuals reacting against conservative US governments. And inversely, some of the worse comics have been written during times of liberal US governments. I'll go on record now as saying if you've written a comic that has Adam Warlock smiling (and it's not because he's found a new way to kill himself.) Then things have gone HORRIBLY wrong. Note: If you were a parent who gave your kids this Book and Record set, What the hell were you thinking? Seriously, It's Fun to Read As You Hear somehow doesn't line up with Night of the Laughing Dead, now does it? Anyway, Man-Thing, as well as Gerber's Defenders, was just chock full of great hippy musings. I think part of the charm of those comics was seeing Gerber wrestle with anti-establishment storylines and counter culture topics while working for Marvel. As such, the Man-Thing sort of became a benchmark for quality for the Marvel Monster books of the 70's. On the flipside, what did the Clinton years bring for poor old Man-Thing? That's right, it burns, it burns, but not in they way it's supposed to! 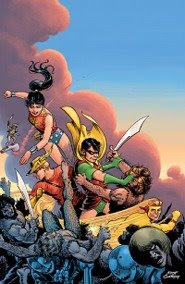 Really, I challenge you to find a worse comic cover NOT printed in the 90's... I can't comment on the quality of the story, but the particular Man-Thing run only lasted about 8 issues, so I think it's safe to say it sucked. Okay, how about this. In the 70's Rich Buckler kept us mesmorized with his innovative and gripping story of Deathlok, a cyborg superhero fighting in a corporately controlled future. 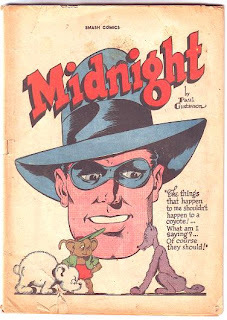 I bet Stan Lee could come up with 1 million cover blurbs without ever using the word Mired. Okay, here's my final example. Avengers during the 70's. So, now that I've *proven* my point, I think we can safely accept my theory that quality in comics is going to take a nosedive if a Democrat gets into the White House. And for every Mage or Marvels the naysayers to this theory might bring up, I can easy point to a Clone Saga or Extreme Justice. So, if paper prices continue to increase, and story quality declines, then paper comics are going to be looking at at least 4 years of declining sales. Want to prevent this dark future? Well, if you want more Reagan Era Watchman/Dark Knight quality coming from comic publishers, the choice is clear. For today's Free Comics Monday, I'm proud to announce to we have a new Flashback Universe comic ready for everyone to read! 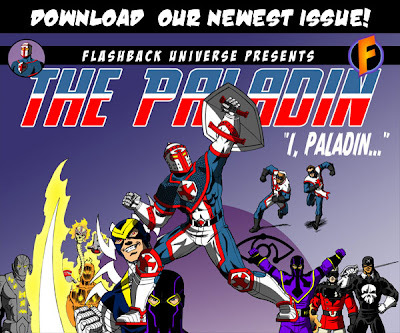 This issue features The Paladin with a story plotted by Pierre Villeneuve, Scripted by Chad Bowers and Art by Pierre. Click the image to download this new comic! If you don't follow Heidi MacDonald's The Beat, I suggest you check it out. It's probably the premiere news blog for the comics publishing industry. [...on the issue of this affecting comic prices or publishing schedules...] For one things, other printers would be happy to pick up business which, as precious as it seems to comics fans, isn’t that huge an undertaking. Should things worsen and Quebecor Press heads south (and I don't mean to Pennsylvania) it could have far greater short-term (at least!) effects on the comics market than anything else this year. Hard to say whether Heidi is correct or Mr. Grant is at this stage at the game. Both have wide knowledge of the comic industry, but its not uncommon for two intelligent people to view a situation completely differently. for the Quebec government to let any of them fall. There’s one price factor that far outweighs the dollar: Timber prices. With the shrinking print market, and the moribund housing industry in the US, big loggers are (not quite) going begging for work. Happens I have a managed woodlot that’s due for harvest, but there’s no way I’m going to have it cut, not with where the market is nowadays. Again, the reason all this is important is because Quebecor publishes all the comics for DC and Marvel. If as a result of all this hoo rah, the big two have to take their comics to another publisher who doesn't cut them as sweet a deal as say, a printer basically subsidized by the national government, then you can expect comics to become more expensive. I spend so much time talking about digital comics and the oncoming paper comic apocalypse that it is sometimes easy to think that the only unique and interesting thing about Flashback Comics is their format. I'd like to change that today by discussing something else I think makes Flashback Universe comics unique in today's comicscape: All FBU stories are Done-In-Ones. I know many readers and creators feel that the DiO format is too confining, but I've heard writers say the same thing about short stories. I think a good writer can find a way to tell a compelling story regardless of the amount of room he has, as long as he understands the limitations of the specific storytype. 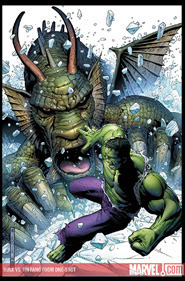 Two great DiO examples that recently came out are the Hulk vs Fin Fang Foom and the Lost Teen Titans Annual. In both cases the stories were told completely in one comic. 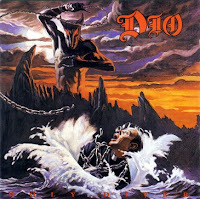 Albeit, one was the posthumourous work of one of the all time masters of the DiO story, Bob Haney The other was by Peter David, who while doesn't have quite the resume of DiO's that Bob Haney has, he is a master of many, many different type of story formats (novel, screenplay, comic, editorial). All of the FBU comics are DiOs because it's my intention that no matter what issue a visitor to the FBU site chooses to download, they can be assured of getting a complete story in one form or another. I selected the DiO format not because it's easy to write (it's not) but because I think it's really the best for format for web content - complete bite size chunks that you can download - similar to how YouTube videos work. Several people have asked me about making a web comic version of one of my Flashback stories, and while I'm not completely opposed to the idea, I'm not wild about it either. I think one of the problems with Web Comics is the way the most current page of a web comic has to act as an introduction to the rest of the comic-- To paraphrase -- Jim Shooter, every web comic episode is someone's first. Even with the best interface (check out the Jon Sable online comic at ComicMix.com) it's difficult for people to get engrossed in the story because many things outside of the artists control (browser compatibility issues, server lag, user UI awareness). Comics used to sell a heck of a lot better when they were all DiOs. Heck, based on the recent numbers of Archie comics sold the past year, they seem to be selling well now too. I think it would be an interesting experiment if either Marvel or DC gave up on their multi-issue story arcs for a year and just did 12 issues of DiOs for their entire line. Imagine being able to pick up any issue by either publisher knowing you'll get a complete story. Sounds cool to me. Welcome to another Free Comic Monday. The last one was a big success with quite a number of downloads. To those of you who commented or emailed, thank you! Shares of Quebecor World plumbed new depths this morning after the beleaguered printing colossus missed a deadline to find $125-million in new financing. The stock fell as far as 18 cents at about 11.30 a.m. EST in Toronto, and an hour later had crawled back to 24 cents, down by 23 cents from Tuesday’s finish and, hard to believe perhaps, by a whopping $16.96 from its 52-week high of $17.20. Quebecor World has lined up a $400-million bailout package from parent Quebecor Inc. and Brookfield Asset Management’s Tricap Partners, but the deal requires the support of the printing company’s banks, which investors and analysts appear to suggest will not be forthcoming without massive changes. This reason this is significant is because Quebecor is the printer both DC and Marvel currently use and I suspect the final outcome of this financial restructuring, if it gets resolved in Quebecor's favor, can only result in higher priced paper comics. controversial new book that debuted simultaneously on shelves and MySpace. 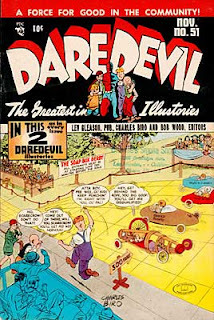 the sell-out of the first issues. I would like to introduce everyone to a very cool 3D Comic Book Viewer! read various sections of a real comic pages. how to improve it etc. Give it a try! It's very cool! ...Bear with me while I sketch out the structural changes in the paper market. In years past, publishers bought from a wide constellation of papermakers. So it was easier to play one supplier off another to get price cuts, and thus manufacturers' attempts at price increases often did not stick. All these deals have dampened supply. Coated paper prices increased 10% last year, and further hikes are expected in '08. Newsprint prices will balloon 11% this year, according to industry tracker Pulp & Paper Week, although other observers are convinced prices will go even higher. The crowning irony is that this is happening even as dropping circulation has taken much demand out of the market, and thus the suddenness of the increases has surprised many. This doesn't sound like good news to fans of paper comics. Or for the people who sell them. It used to be that people would suggest going back to the old newsprint style paper to save the industry, but now, even that might be too expensive. Didn't DC and Marvel just go through a price increase last year? I wonder if they are prepared to go through another? Why do People make Indy Comics? Summary: A serial killer has been stalking women and his latest victim, Eden, has somehow survived. In surviving, Eden absorbed little pieces of each the other victims’ personalities. With this quiet menagerie of voices in her mind, Eden sets out for revenge. Do you want to write/draw your own comic, and if so, why? I think I've mentioned the number of emails I get with people wanting to write/create characters for the Flashback Universe, and often I respond to these by asking the emailers why don't they create their own comic/cbr? One of the things I never ask is why do you want to create your own comic anyway? 2) To make lots of money! Because we all know what a goldmine Indy comics are. So, if you don't mind, tell me why you want to write/draw your own comic. 1) How does one get an invitation to Komic's Live? Anyway, apparently they are an *invite only* forum and several of their threads seemed to link to this blog, so I'm interested in seeing what they are saying. 2) Why don't more people download Herbie the Fat Fury? I have no idea whether Herbie is in public domain or whatnot, but damn it's a funny comic! Apparently, only 100 people on Zcult agree with me. Almost as many people find Kade worth downloading. Go figure. 3) What is Suske en Wiske, and why must it be uploaded in single issue torrents? 4) How many voters does it take to win a Zuda Competition? Check out these two screenshots from the two Zuda Winners so far. Now, albeit, it's possible that many factors are weighing into the visitor/voter relationship with both winners, and it WAS a Holiday season, so that might have affected the voting results, but overall, doesn't it look like Pray For Death won with just a little more than a third of the votes that High Moon previously got? And only half of the views? It's interesting to see how many old Golden Age comics have been scanned! Also interesting is that so many Malibu and Epic comics have been scanned.